Joe Biden (23) Democratic V.P. This book is hilarious, easy to read, and emotional at times. This is a book that seems to be written in a way that would appeal to younger readers, it is written rather informally, which makes it easy to read and at times hilarious. What makes me say "hilarious" is simply the title of Chapter Two: Hot Young Biden (1960-1972). The chapter features tweets from Twitter from random people reacting to a photo of Biden from his college days--some went into some detail about how attractive they found him to be, emojis and all. I wouldn�t have included them If I were writing a political bio, but I did find it entertaining to read. As he mulled over where to go to college, Joe thought about becoming a priest. Even though he had �dated a lot of girls� by that point, he still felt his calling of the frock. So, he went to the University of Delaware, dated more girls, and basically turned himself into Hot Young Biden. [He] confessed: �I probably started my first year of college a little too interested in football and meeting new girls. There were a lot of new girls to meet.� He drove to Fort Lauderdale with some buddies for Spring Break. Yet he was bummed to find a mob of silly drunken college kids, all of them acting stupid. That reminds me of my great grandmother who had also claimed she had never touched any vice. She avoided alcohol/cigarettes/drugs for the same reason as Joe: she had seen what damage alcoholism and cigarette smoking had done to her family, and decided she wanted no part in such unhealthy behaviors. That takes guts; that is an example of truth to one�s own beliefs and philosophy. These are not things anyone needs in life, and for Biden to not even have the curiosity to try even one beer, really shows the internal strength he has and the unwavering dedication for sticking to what he sees as right. Biden�s advertising techniques are crazy enough to be good. I like that he advertised in his own way. He knows how to self-advertise as well as how to stay relevant. His advertising displayed his confidence front and center. On campaign finance: Biden didn�t take what he considered a bribe in his first run for senate, even though he needed the campaign donation, because the donation, he felt, came with strings attached. He stuck to his beliefs and said he wouldn�t even consider lowering the capital gains tax if he were elected, even though if he had agreed to even just �consider� it he would have been given money for his campaign which he so desperately needed. As Team Biden neared the finish line, they were running out of money. And they needed to keep their radio ads on the air�. [a meeting with some fat-cat investment counselors.] They were ready to give. In a private meeting, they asked Biden what he thought about lowering the capital gains rate. He told them he wasn�t for changing capital gains. [Instead], he took out a second mortgage on his home. The ads stayed up. [Biden] won by just 3,162 votes. On personal tragedy: Upon starting his work on Capitol Hill, right after the 1972 election and before he was sworn in as Senator, Biden was faced with the loss of his wife and daughter. The book references a transcribed phone call he received from Nixon after losing his loved ones. On empathy: Accompanying this transcribed call is an excerpt from a speech he gave to families of soldiers that died in the line of duty. The book highlights that empathy is one of Biden�s �fundamental qualities�, based on how he coped with the loss of his loved ones. This is another example of Biden�s strength as a leader. Facing the most tragic of odds, he was able to endure and stay focused on being there for his two sons, and what he needed to do in Washington. The tragedy of the accident, in a sense, helps us understand one of Biden�s most fundamental qualities: empathy. He connects with people. And as he told the class of 2017 at Colby College, forming personal connections � through empathy � is the one successful trait that he sees in all the best world leaders. Caring about your colleague as they�re dealing with a sick parent, or their child [who] graduated from college, or the child was in an accident. That�s the stuff that fosters real relationships, breeds trust, allows you to get things done in a complex world. The person on the other side of the negotiating table, the other side of the political debate; a person who doesn�t look like you, who lives in a community you�ve never visited, a person who has a different background or religion than yours. They�re not some flattened version of humanity, reducible to a collection of parts and attributes. They�re a whole person, flawed, struggling to make it in the world just like you. Bottom line:The pundits say that Biden's biggest challenge in the 2020 race will be connecting with young voters, because of the intense competition for that demographic from Beto O'Rourke and Bernie Sanders. But I'm a young voter, and I felt a lot of "connection" in this book � perhaps the pundits should talk with more young voters before they count Biden out. Joe Biden: 1962: only white lifeguard at pool of African-American kids. Joe Biden: Delivered eulogy for segregationist Senator Strom Thurmond. Joe Biden: Marriage is all about "who do you love", of whatever gender. Strom Thurmond: Openly segregationist; tried to block 1965 Civil Rights Act. Joe Biden: Quit corporate law firm rather than help big business. Joe Biden: 1972 Senate race: Opposed capital gains tax cut. Joe Biden: Never touched beer, alcohol, cigarettes, or pot. Joe Biden: College plagiarism was honest (but careless) mistake. Joe Biden: 1990: Pushed through Violence Against Women Act (VAWA). Joe Biden: 2008: Pakistan is the world's most dangerous country. Joe Biden: National effort to cure cancer by genomics. Joe Biden: 1972 campaign brochures included photos with incumbents. Joe Biden: 1972 campaign ad: "Do you trust me?". Joe Biden: Thought about priesthood, but dated a lot of girls. Joe Biden: Biden Doctrine: Stick up for the little guy. Joe Biden: 1972: unseated Republican incumbent Senator Caleb Boggs. Joe Biden: Personal connection is key trait of all world leaders. Joe Biden: Accused of plagiarism in 1987 presidential primary debate. Joe Biden: 1988: suffered brain aneurysm and 9-hour emergency surgery. Joe Biden: Boyhood speech impediment dominated his schooling. Joe Biden: School nuns helped Joey overcome boyhood stuttering. Joe Biden: Vietnam war was horrendous waste based on a flawed premise. Joe Biden: 1993: Arm the victims: end the Bosnian embargo. Joe Biden: Son Beau served in Iraq while Delaware Attorney General. The "Book of Joe" is an unauthorized biography of Joe Biden, written without Biden's input, by a well-known journalist (Jeff Wilser places his name on the cover in the same font and size as "Joe Biden," which makes it look like an authorized biography, but that is just layout trick � if you look closely, there's an "of" before the "Joe Biden.") The book reviews several relatively unknown aspects of Biden's childhood and early career, as well as his later and better-known accomplishments (published in 2017, hence after Obama/Biden left office and before the presidential 2020 race started). We'll explore here the title, which is nearly identical to "The Book of Job." You'll recall that's a section in the Bible, and it's pronounced "Joe-ub" with a long "O" like in "Joe." I actually read the whole book without noticing that, until I uttered the title to another OnTheIssues editor � then I wondered if the author realized the association, and I'll explore here why the association is obvious. The biblical "Book of Job" is about a man named Job, a wealthy man with a large family who has his faith "tested" by God. Over time, Job loses his family, loses his wealth, loses his health � the test is whether Job can maintain his faith and spirit, even though he was the recipient of so many undeserved negative events. Job mourns and is dispirited, but maintains his confidence that he will eventually be redeemed. 1950s: Biden's childhood was marred by heavy stuttering, with concomitant school bullying. He overcame that speech impediment before he got to college (pp. 3-7). 1966: Biden was caught "plagiarizing" in a law school class, due to "poor citation methods" rather than anything intentional, he says apologetically (pp. 26-7). This incident has plagued him ever since, in many elections, especially in the 1988 presidential primary, where Biden was accused of plagiarizing parts of a speech (pp. 74-7). 1972: Upon getting elected to the U.S. Senate for the first time in 1972, Biden's wife and child were killed in an automobile accident (Biden was not in the car); Biden almost resigned from the Senate before getting sworn in (pp. 45-51). 1988: Biden suffered a brain aneurysm while on the preidential campaign trail in 1988. He credits withdrawing from the rac (partly due to the plagiarism incident above) with saving his life, since he got medical attention and emergency brain surgery instead of pushing forward on the campaign trail (pp. 89-92). 2015: Biden's son Beau was elected as Attorney General of Delaware in 2006, and was planning to run for Governor in 2015 when he was stricken with brain cancer and died. This event is generally considered the primary reason that Biden did not run for president in 2016 (pp 158-66). 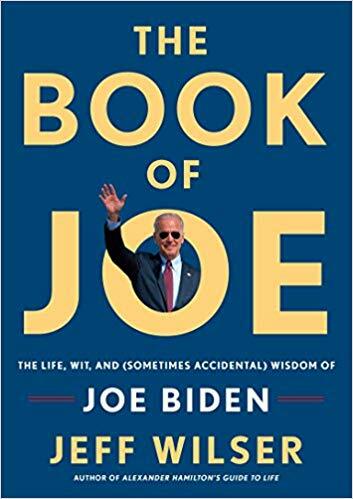 Any one of those events could be considered a life-defining event, and indeed they have defined Biden's life, as noted in many of the excerpts from this book. Having four such events in one person's lifetime can only be described one way: "tested like in the book of Job." Martin Luther King famously said, "unearned suffering is redemptive" (and MLK, familiar with the Book of Job, used language consistent with that book). Joe Biden has been "redeemed" by plenty of unearned suffering (ok, maybe his plagiarism suffering wasn't quite unearned, but we accept his explanation that he was a young and sloppy student, and it was just his bad luck that he was the one caught and punished). The result of Biden's redemption is that he knows he can handle anything. In that context, he was a good pick as Vice President for "No-Drama Obama." In 2020, that translates to "able to handle Trump's taunts and Republican bashing." Biden has handled taunts all of his life and hence will be unperturbed by Trump. The first Republican bashing came this month with newly-publicized records of Biden opposing school busing in the 1970s � that's a serious matter but Biden took it on with equanimity. Expect to see more example of unperturbed equanimity as the 2020 race proceeds.